Shropshire Council wants to charge you more for parking (see the consultation). It will cost more to park on the street and to obtain a residents parking permit. Charges to park your vehicle if you are a builder are to soar. Car parks will be more expensive, with full cost charging on Sundays and no free parking until eight in the evening. Limits on how long people can park are to be abolished, ending short stay parking in the town. This scheme is totally wrong for our town. It will damage trade. It will cost residents and visitors more. There is no guarantee than any of the money raised will be used for improvements in Ludlow. Here is a summary of the changes. You have until 17 October to respond to the consultation. Linear pricing is to be introduced. This means that you pay the same hourly rate all day and every day, except overnight which will be free in Ludlow. Free parking in Ludlow’s three car parks will begin later in the evening – at 8pm instead of 6pm. On-street parking will cost £2.00 an hour. The current cost for the maximum stay of three hours is £2.20. This maximum is to be abolished, with the council relying on high charges to ensure turnover of vehicles. Castle Street car park will no longer be short stay. The weekday charges will double from £0.50 an hour to £1 an hour. A one month season ticket will cost either £116.00 or £133.33, depending on the outcome of the consultation. Season tickets are not currently available for this car park. Residents will be able to buy annual season tickets costing either £1,280.00 or £1,600.00 to park any time of the day. For evenings and weekends only, the season ticket will cost either £640.00 or £960.00 a year. Shorter season tickets will not be available for residents. Upper Galdeford A car park – that’s the top level by the Library and what was Budgens – currently charges £0.50 an hour. The weekday hourly charge will not change. The current rate for a monthly season ticket is £72. This will be reduced to £58.00 or £66.67. Annual residents 24×7 season tickets will cost £320.00 or £400.00. Weekend and evening tickets will cost £160.00 or £240.00 a year. Upper Galdeford B car park – that’s the lower level towards Tesco and the Foyer. Here it costs £0.40 an hour to park. This will cost £0.30 an hour under the new strategy. A monthly season ticket will cost £34.80 or £40.00, compared to £36 now. Residents can pay £192.00 or £240.00 a year, depending on the outcome of the consultation, to park all day, any day. An annual weekend and evening ticket will cost £96.00 or £144.00. Smithfield car park currently charges £0.40 an hour, with up to ten hours costing just £2.00. The hourly charge will be just £0.30 an hour under the new strategy, but ten hours will cost £3.00. A monthly season is currently £30. This will rise to £34.80 or £40.00. The costs of season tickets will be the same as Galdeford B. 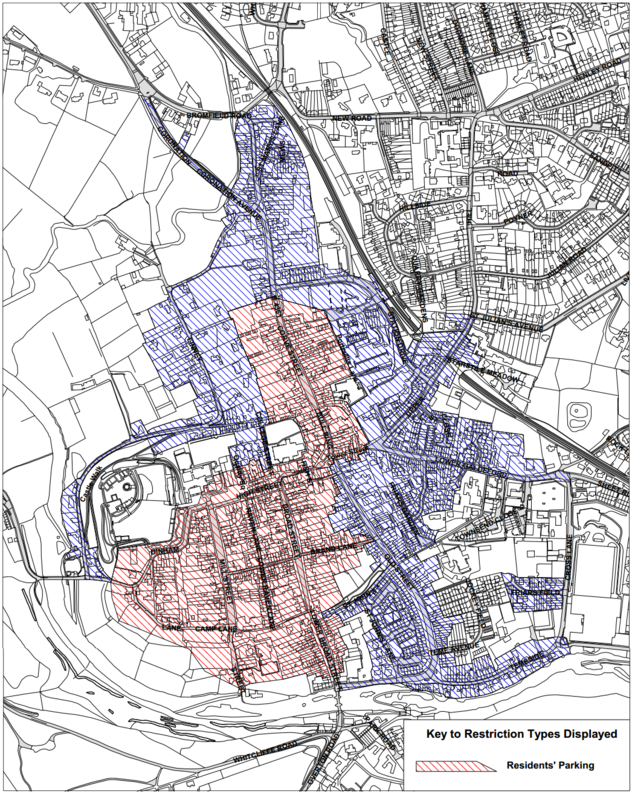 Residents permits for the Red and Blue Zones cost £50 a year at present. This will double to £100 a year. The proposed charge for residents permits includes a £31 charge for enforcement officers to come and slap tickets on cars that overstay their welcome or should not be parked in the red or blue zones. A further £19 will be paid on administration and £50 on scheme administration and maintenance. Parking waivers allow tradespeople to park their vehicles for up to one day in a car park, on-street parking area or a restricted parking area while they carry out work. There are currently two types of waiver costing £10 or £15 a day. A new single waiver will cost £20 a day. I can’t find any information on what will happen to waivers for health professionals, such as doctors and carers. These currently cost £15 a year.
. I assume that evenings will begin at 8pm but this is not made clear in Shropshire Council’s documents.